The Wide Distressed Picture Frame featured here are great for distressed weddings, shabby chic decor, and nurseries, as well as any type of rustic home decor. Each is handcrafted and unique, and they are available in a wide variety of colors and sizes. You can choose your size and color from the dropdown menu on the right. 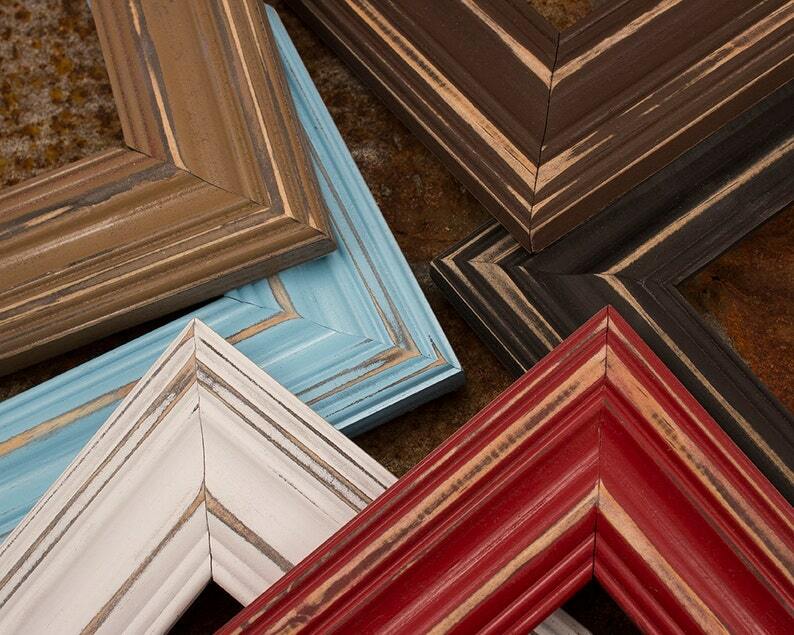 The frame moulding is two and one eighth inches wide, and frames up to 20x24 include glass, backing, and hangers. Frame size is determined by the size artwork the frame will hold. For example, if your artwork is 8x10, choose an 8x10 frame. The visible area of the artwork will be approximately 1/2 inch smaller than the size of the frame. For example, the visible area of an 8x10 frame is approximately 7.5x9.5, due to the lip of the frame that holds in the glass and artwork. COLORS PICTURED ABOVE: From left to right, top to bottom in the first photo; Nutmeg, Aqua, White, Espresso, Black, and Colonial Red. In the second photo; Stone Grey, Lagoon, Heirloom, Summer Squash, Baby Pink, and Lilac. Please note: various screens display colors differently, and actual color may vary slightly from what is pictured. We can make any size that you need, just contact us with any questions or requests. We DO NOT ship to Alaska or Hawaii! Thanks for visiting, and we hope to talk to you soon!